Media Loves our MINT non-peroxide Home Teeth Whitening Kit. We have spent loads of time searching for the teeth whitening home system so that we can offer one of the very best products in the whitening industry. Our dedication has paid off and we have thousands of satisfied customers! MINT Whitening Kit has been referred to as the ‘Gucci’ of home teeth whitening market. 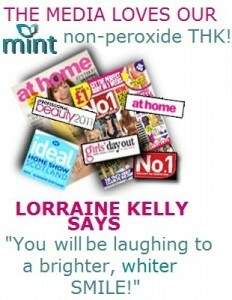 The kit we offer to our Patients was featured in No.1 magazine and was reviewed in At Home magazine by Lorraine Kelly. You will feel ZERO SENSITIVITY while using this non-peroxide kit at home and the results are 400% faster than with standard carbamide peroxide based gels.